PURPOSE: Use this document as a reference for assigning tenure information to Faculty in ctcLink. AUDIENCE: HR Specialists and HR Administrators. 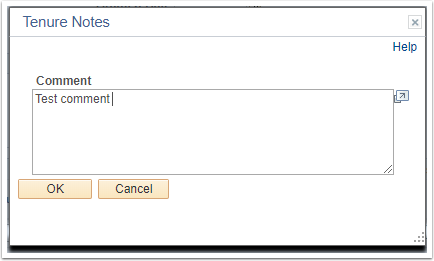 Enter the Empl ID (or fill in any of the criteria fields to perform your search). Select a Tenure Status from the drop down menu. Select a Home Rank from the drop down menu. The Track Start Date defaults to today's date, change if applicable. The Change Date field will auto fill the date entered in the Track Start Date field, change if needed. Select the appropriate Change Reason. Enter/Select the Original Track Date (this is the date in which the tracking will begin). Select the Tenure Home from the drop down menu (this is the Department from which the employee is receiving tenure). Enter the Mandatory Review Date, if applicable. Enter the Granted Date, if applicable. You may receive a WARNING MESSAGE for any date(s) entered either 30 days in the past or 30 days in the future. Be advised that you can still proceed with saving your entry. Select the Notes link to add comments about this record. 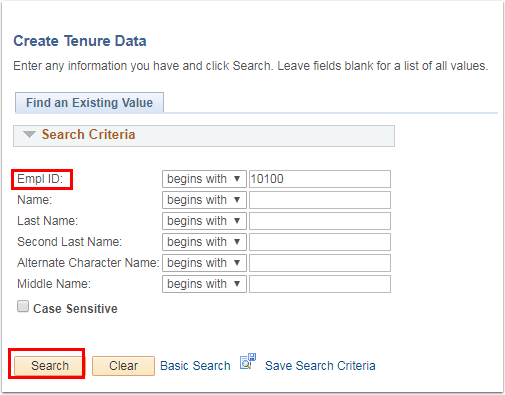 Select OK, to go back to the Tenure Data page. The Prior Experience/Credits tab, and Service History tabs are currently not being used.